Won’t you join Team Tripawds? Sign up and get your friends to sign up too! 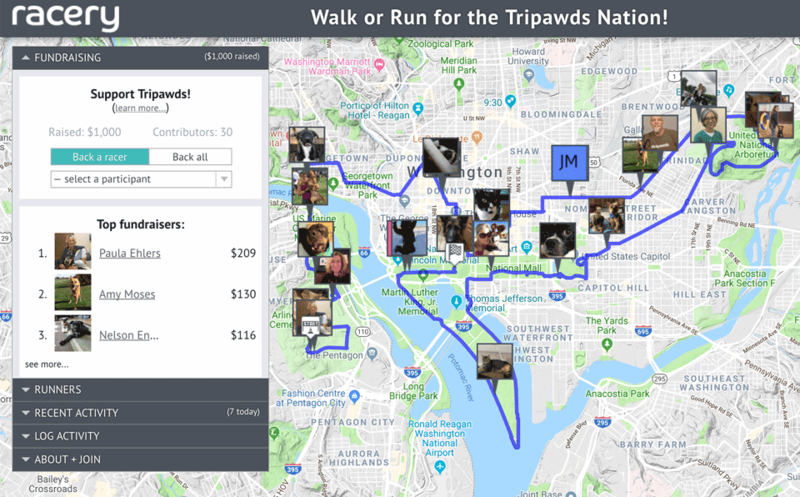 The race entry fee is only $20 and $10 of every entry will go directly to Tripawds Foundation , so you’re already helping out just by joining the team! So it’s better for someone to sponsor a runner, instead of signing up to run, correct? More $ for Tripawds. We appreciate everyone who wants to run or donate, but yes, a person can donate more than the amount that one runner sign-up earns ($10 per runner). Make sense? This link will take anyone directly to the donations area. Sponsor the team, a runner, or join in yourself, we are Thankful for all participants! Admin Guy made a fantastic video that explains how to support the race! Oh yaaaaay! It’s definitely not a race, so whatever you do is pawesome! Our plan is to do at least .67 miles a day. Thank you for joining us! What do you mean it’s not a race?? YAY! So thrilled to have you join #TeamTripawds, thank you! Tina you can race against Admin Guy if you want! Thanks everypawdy! Keep up the good work. 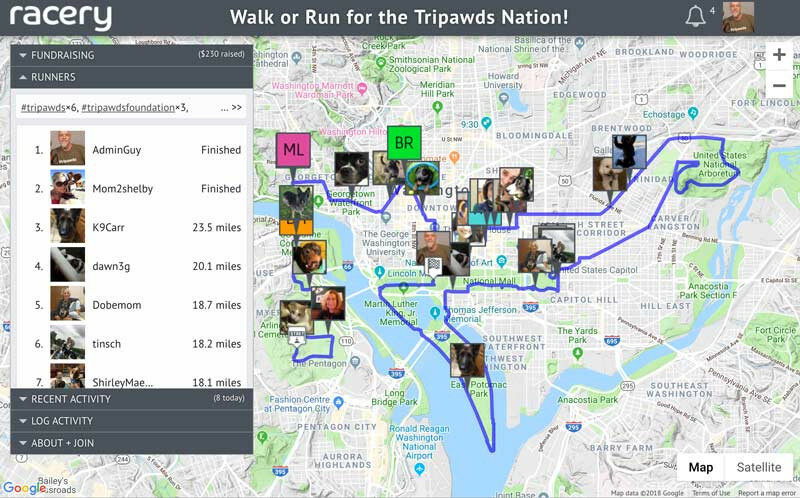 Have you checked the Tripawds Virtual Marathon Map lately? This just in…2 Racers Runners have already finished their first 26.2 miles. 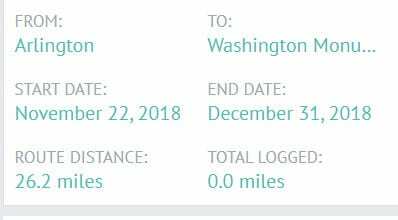 There are now 32 participants who have already logged 332.6 miles and helped raise $230 for the Tripawds Foundation . And, there are 35 days to go! 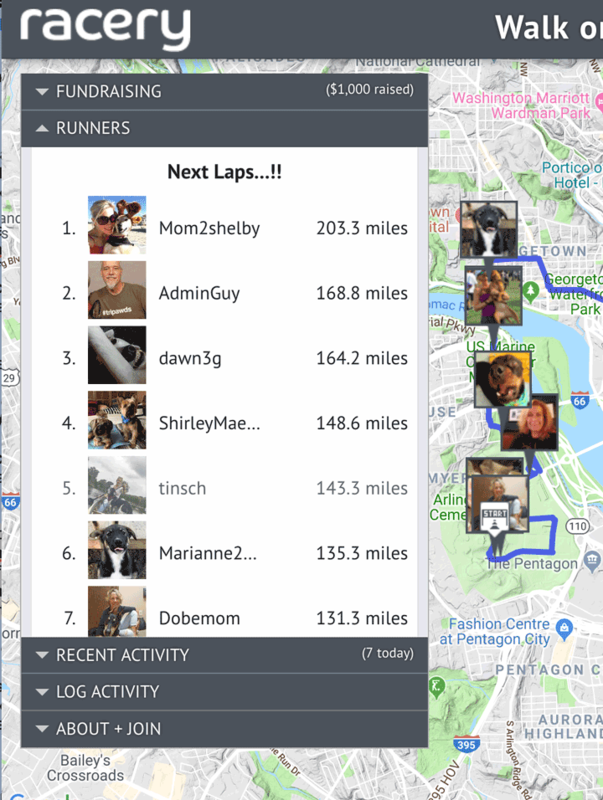 Thanks to the fine folks at Racery: Virtual Challenges, “Looping” has been enabled so all runners and walkers can continue to have their miles tracked on the map, beginning again at the starting line once they complete their first full distance. 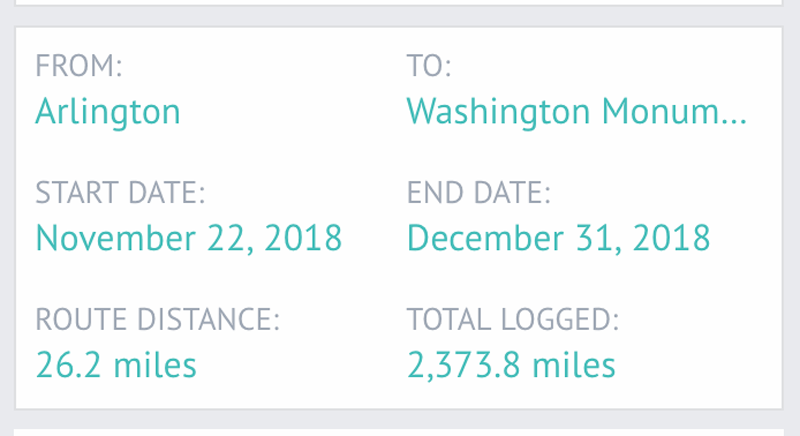 Along the way, everyone receives postcards from milestone locations along the route through Washington, DC. 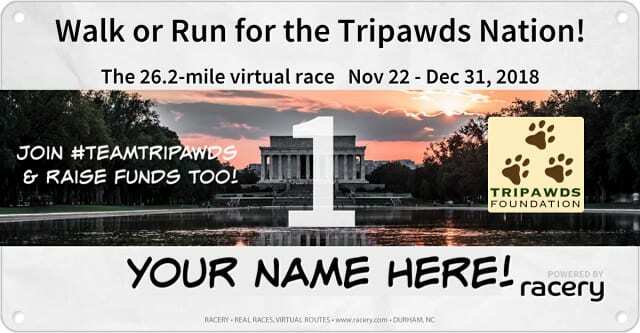 There are now 38 racers participants in the 2018 Tripawds Virtual Marathon! Many are on the second or third lap around the course and all have help raise more than $400 for the Tripawds Foundation …with 30 days to go! See a recent video of the current activity in this Tripawds Facebook post. 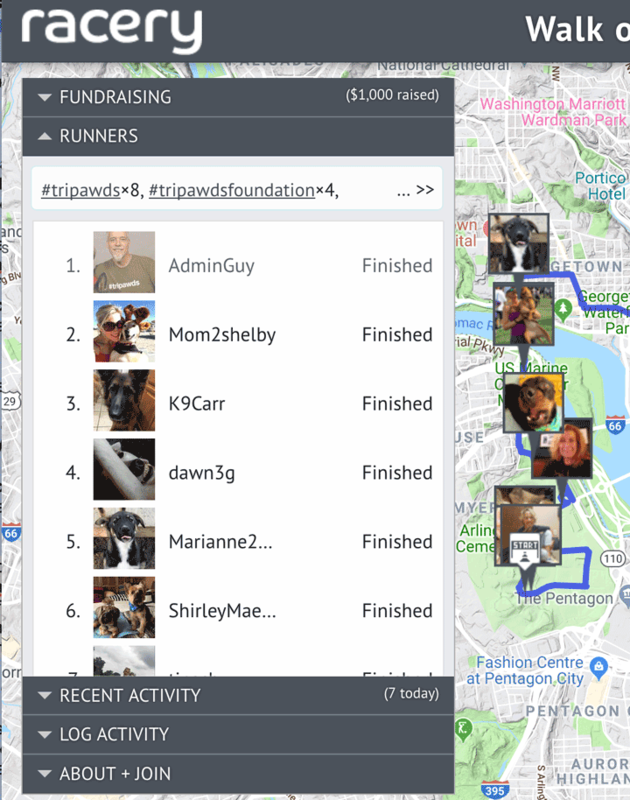 More than 40 runners and walkers are logging more than 2,200 miles to support the Tripawds Foundation with $811 raised so far. Check out the map and back your favorite racers supporters to help us reach $1000 before the race ends on December 31, 2018. Many thanks to Racery: Virtual Challenges for making this fun event pawsible. If you are participating, put in those final miles and share your link to help us reach our goal. The clock is ticking down on the year, AND the final miles of the 2018 Tripawds Virtual Marathon!